It’s not often manufacturers offer us the chance to test old versus new models, back-to-back, but that’s exactly what BMW did in Spain this weekend. The original world press launch of the awesome 2012 Beemer was held at Valencia’s Ricardo Tormo circuit at the end of last year. As epic as the GP track is, and as epic as the S Thou’ was, the surface was greasy which shafted confidence and rendered the updated traction control fairly useless – the TC light was permanently illuminating the dash. Valencia also lacks any UK ‘real-world’ features, and didn’t truly highlight the 2012 bike’s new geometry and fresh skills. The two models look near-identical, but BMW has worked alongside Superstock teams, listened to the world’s press, and gathered feedback from customers to refresh for 2012 – more midrange, sharper geometry and improved electronics are the highlights, amongst a host of modest but influential changes. We spent the first day thrashing the 2012 bike in the mountain roads surrounding Almeria, followed by a full day’s open pit lane at Almeria’s circuit, where the 2011 and 2012 versions were present. The verdict? Let’s just say we’re glad BMW gave us a second chance to test the new bike and truly exploit its potential – it’s an absolute animal and much improved on road and track. Ducati’s Panigale has been stealing the limelight in recent months but the RR is still special, very special. 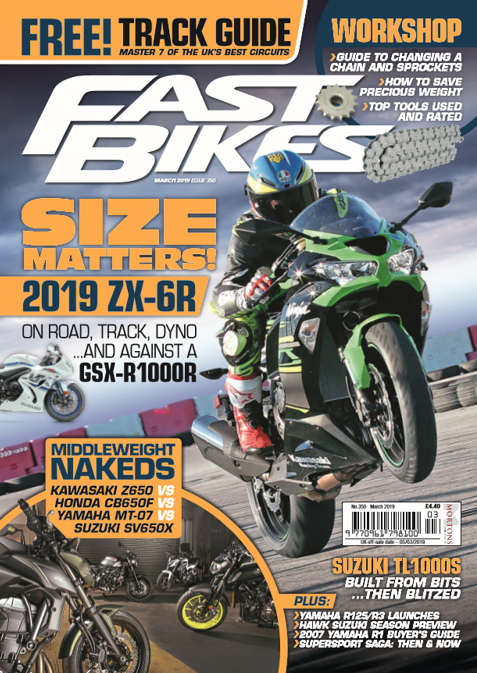 Check out the next issue of Fast Bikes for low-down, and our YouTube channel for some funky vids. Next Post:Bike Trackday Trophy Goes Live – Register now!